Policy Debate is a form of debate in which two teams (Affirmative and Negative) argue for and against a resolution that typically calls for policy change by the United States federal government. 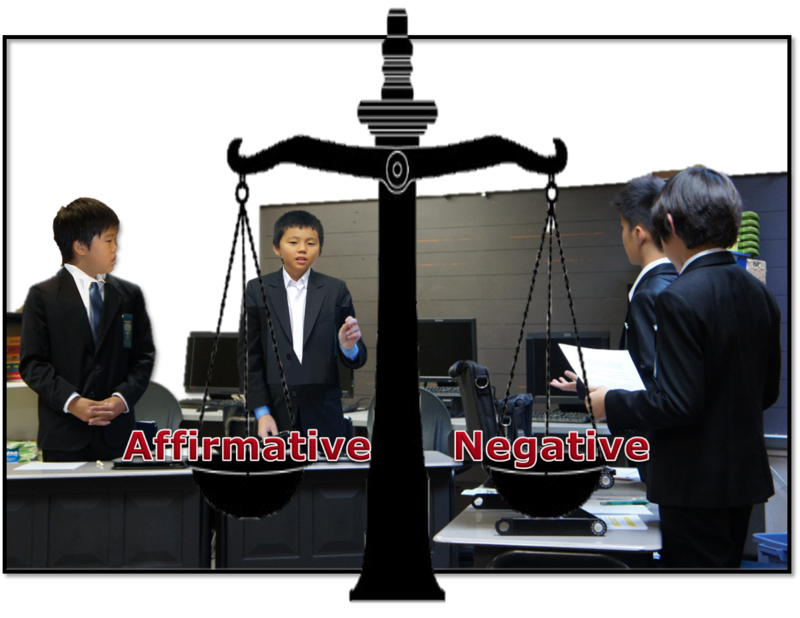 It is also referred to as cross-examination debate (sometimes shortened to CX) because of the 3-minute questioning period following each constructive speech. Affirmative teams generally present a plan as a proposal for implementation of the resolution. The negative will generally prove that it would be better not to do the plan or that the opportunity costs to the plan are so great that it should not be implemented. This is recognized as one of the most difficult and challenging type of debate because it involves in-depth research, practice, and speed. Because of its high recognition, more college scholarships are given to policy than any other types of debate. This is truly a debate that trains the mind of future elites. Learn to take notes with symbols and speed. Learn to argue with speed in a persuasive manner. Question 1: What is the difference between Public Forum versus Policy? I know many students and parents don’t understand the difference between PF and Policy, so let me try to explain in a simple manner. Public Forum debate is a recent (about 15 year old), easier modification of policy debate because too many judges were complaining that they didn’t understand policy debaters, as policy debate – over almost 100 years of U.S. debate history – has become esoteric for average audience. NSDA also needed to make it more inviting for students to start debate, so they created PF debate to lower the bar and the fear factor of beginners. PF topic changes every month because it is meant to move quickly from topic to topic, so no need to dig deep, but policy debate topic changes once a year because it is meant to be a deep learning experience. Arguably, one year of policy debate is worth getting 2-3 PHDs as students will research, analyze, and debate over thousands of evidence, as opposed to hundreds of evidence for PF. While colleges recognize top PF debaters favorably and admit them more to their campuses at a higher rate compared to other extracurricular activities, debate scholarships are almost solely given to policy students, not PF students, because in the U.S. collegiate level, it is policy that is more widely practiced, not PF. Julian and Mike were also recipients of college policy debate scholarships, and ADL is extremely lucky to have such top policy coaches. Proof: A few weeks ago, Northwestern university debate society sent my son Brandon Chen invitation letter to join their college policy debate team if my son is willing to apply for Northwestern because my son was 1st place at SNFI policy camp. But the same PF champion from SNFI never received such letter from any universities, because US university debate teams mostly do policy, not PF. However, since we are a LDS family, my son will only apply to BYU, not Northwestern. Because I insisted and I personally love policy debate, ADL is the ONLY place you can learn policy in the entire Asian continent: There is no policy debate in China, Japan, and Korea because they believe it is too difficult for Asians. Another reason why they don’t want to teach policy in any other part of Asia is because policy is less profitable for business minded institutions because it requires more expensive coaches, judges, research time, and all else. While colleges recognize top PF debaters favorably and admit them more to their campuses at a higher rate compared to other extracurricular activities, debate scholarships are almost solely given to policy students, not PF students, because in the U.S. collegiate level, it is policy that is more widely practiced, not PF. Julian and Mike were also recipients of college policy debate scholarships. Because I insisted and I personally love policy debate, ADL is the ONLY place you can learn policy in the entire Asian continent: There is no policy debate in China, Japan, and Korea because they believe it is too difficult for Asians. Another reason why they don’t want to teach policy in any part of Asia is because policy is less profitable for business minded institutions because it requires more expensive coaches, judges, research time, and all else. Question 2: Is it more difficult to win in the U.S. with policy debate? No, opposite is true. First, policy debate is a smart choice because the chance of winning with policy is higher as too many kids are now doing PF in the U.S. because PF is much easier. Second, for PF, speaking ability is more emphasized and in policy intelligence is more emphasized. So in a nutshell, PF is more for native kids who can speak fluently and policy is more suitable for Asians who may not speak eloquently, but can argue points strategically. Third, judges for PF are the worst – grandmas, bus drivers, parents, anyone without any debate experience. But for policy, they cannot do that, so they hire the best judges who understand policy, so the judging is not so much based on LUCK, but your MERIT. In sum, there is maybe only a 1% chance your kids can win doing PF in the US, while there is maybe 50% chance your kids can win doing Policy in the US. There are just way too many PF kids in the US – too competitive. However, there are 90% chance our kids can win doing PF in China, Korea, and Japan since English level is all about the same. Question 3: If one chooses to do policy, does that mean one must quit Public Forum debate? Policy kids don’t quit PF, but they do both, just like Eric, Benson, Kelly, Brandon, Allen, Brian, Ginny, and the two Kevins. For policy kids PF is a piece of cake, so they can switch to PF anytime for NSDA China tournaments, but PF kids can NEVER suddenly change to policy. Vice versa for debate coaches: Policy coach can teach any form of debate because policy encompasses all other forms of debate, but PF coach cannot coach policy. This is why, once you have done policy, coaching MUN, World Scholar, Parliamentary, or any other format is easy for a policy coach, as there are no other debate more fully developed, more complex, and more challenging than policy debate. Policy debaters and coaches are at the top of debate practice and expertise, respectively.